So, when I wrote on EMLWY a few weeks ago, saying how I'd been referred on to the hospital again, I assumed that it would be months of waiting for an appointment... NOPE! 3 days later I received an appointment in the post for the following week! When did hospitals suddenly move their butts so fast!? I had mentioned how the doctor I saw a few months ago had suggested the implant to me and another doctor had said she didn't think it would help because of how I've reacted to other similar treatments in the past, so we spoke about that in a bit more detail. Miss Potdar thinks it's worth trying the implant. And to be fair, what have I got to lose? I did explain my concerns with it: how I didn't like the idea of something in me that I couldn't control, how bad an experience I'd had with the Mirena and how I hadn't planned to ever go back on to any pill/IUS form of contraceptive ever again, but it's the easiest option right now and if it doesn't work then it doesn't work. And it could always work, couldn't it!? Yeah, I'm as sceptical as the rest of you but, lets give it a go and see. So, I'm booked in to have an implant fitted on the 21st August and I may also have to take a progesterone pill on the side to counteract any breakthrough bleeding. I'd be lying if I said I wasn't nervous. My skin is pretty clear now, my weight is under control and I know roughly where I stand with my periods - I just hope it doesn't have a bad effect on any of that... Or my endo! 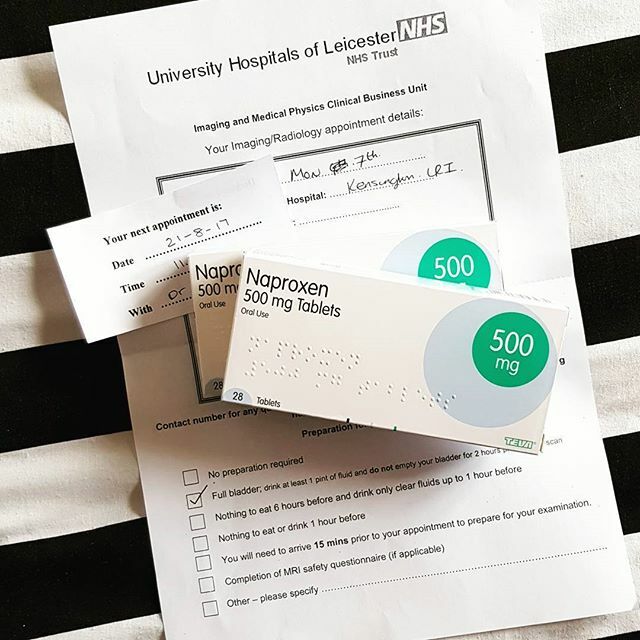 Following on from the implant, the next step to try, if that doesn't work out, is a different progesterone-only pill to the Cerazette I was on after having Hunter, but back to back this time around. After that I would try Depo-provera, a contraceptive injection, for 3-6 months. This might be a bad option for my borderline-osteoporosis but we'll cover that when it comes to it. And then, the final option would be surgery with the aim to remove my left fallopian tube since it's blocked and not of any use, to free up a little space on my bad side. 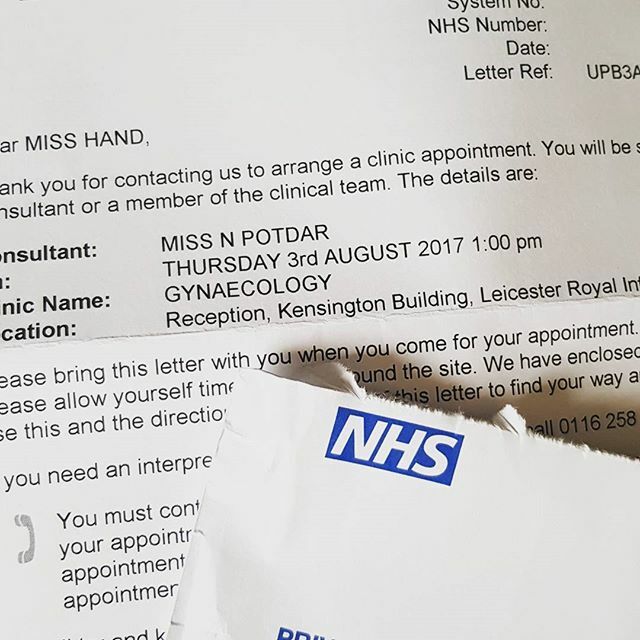 When my doctor referred me back to the hospital, she wrote in her letter about a hysterectomy but Miss Potdar thinks that this is too drastic an action to take, especially at my age and she thinks that removing my ovaries would have an adverse effect on the rest of my health. And above all, she said it might not even help! I know, right!? I've only been told the opposite since I was 21!! So that is the very final thing to try, when we've finally finally exhausted all other options. She wants me to go for an 'urgent clinical scan' so I'll be going in for that first thing tomorrow morning. I'm super nervous because it's an internal scan and they really hurt me. I'm not completely sure what they are looking for but she did talk about cysts and how she expects to see smaller cysts so I think this is to check for larger ones. So, all in all, I think it went pretty well. My new consultant is really friendly and I feel very at ease with her. She seems to have a fresher outlook on endometriosis and I'd even go as far to say she understands it more than the Prof. ever seemed to. She was great when we saw her 4 years ago so when I knew it was her I would be seeing again, I had high hopes for some progess and that's exactly what we've made. Progress. We have a plan! I see her again in December so here's to the next 4 months.